← Day 35: Movie at the Library. 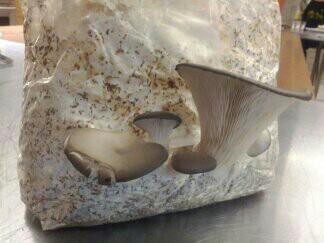 Bow down before the king of oyster mushrooms. Mmmm… mushrooms. If you asked me to choose my last supper, it would definitely consist of some combination of garlic, cheese and mushrooms. After all, they are magic! And so maybe they could grant you three wishes, the first of course being that your last supper would continue for like another 20 years. The second being that every bite would taste better than the previous one. And the third? Well, world peace, of course, and health and happiness for all, blah blah blah. Tonight, I went to a Mushroom Madness workshop at the Evergreen Brick Works (EBW), which is one of their Green Bites Cooking Workshops. The session was led by Bruno Pretto, from Fun Guy Farms (how I love a good pun! ), and supported by Marina Queirolo, the Food Program Manager at EBW. I wasn’t exactly sure what to expect, but when I walked in, the aroma of sautéing mushrooms wafted through the air, enveloping me in its earthy embrace, and I, much like Pavlov’s dog, started to salivate almost immediately. Divine! 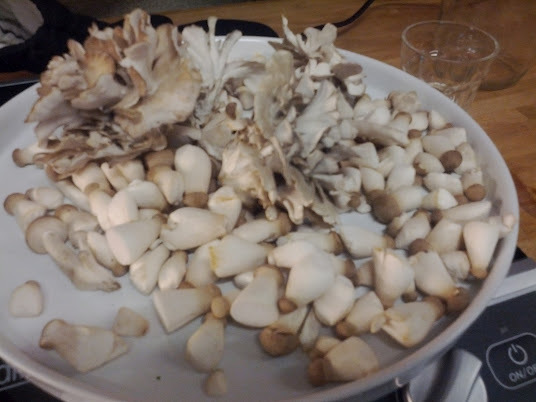 We got to savour these mushrooms as Bruno talked through some slides on different varieties and their properties. I retained nothing, as it was hard to hear over the sound of harps playing angelic music in my head. The mushroom maestro at work. From there, we all pitched in to help prepare the evening’s dishes, starting with assembling an arugula salad with some raw mushrooms that were marinated in a delicate lemon vinaigrette, then roasting some oyster mushrooms with olive oil and garlic for polenta with roasted oyster mushrooms (naturally) and a gorgonzola butter sauce. Seriously. Half butter, half cheese. 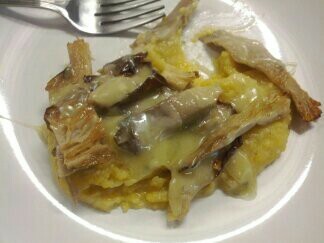 So simple, yet so luxurious and perfectly paired with the mushrooms and polenta on the palate. 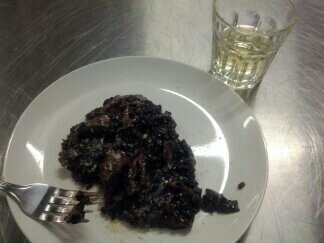 As if that weren’t enough, we concluded with a black rice risotto with mixed mushrooms, butter, white wine, and grated parmesan. And, of course, a whole lotta love. 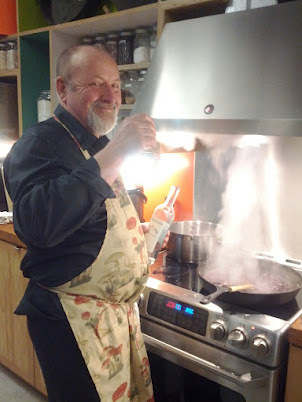 Bruno had made his own mushroom stock for the risotto, and was kind enough to share the four(!) bottles of wine he brought for it with us as we indulged in our decadent creations. And behold the splendid beauty that is this tasty trio – Sorry you missed it. (Note: I didn’t get a chance to snap a picture of the sautéed mushrooms at the start, as they caught me off guard, and by the time I thought of it, well… they had already gone to a better place). Throughout this heavenly feeding frenzy, Bruno also explained the processes involved in both indoor and outdoor fungi cultivation. 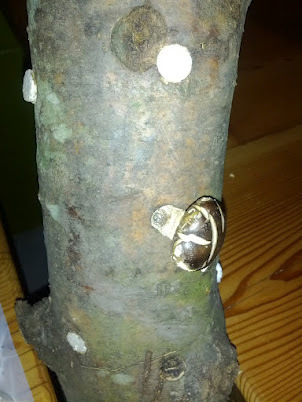 Some mushrooms, like the oyster, take only a few days to ‘fruit’ from a bag, whereas others, like the shiitake, can take several months to a year, as they sprout from logs. This corresponds to their relative prices. He brought samples of at least half a dozen varieties for us to examine, including the infamous chaga, which I had tasted in a tea a couple of weeks ago at the ultimate spa day ear candling event. In its raw form, there are many things you might be tempted to call it, but I assure you, mushroom is not one of them. 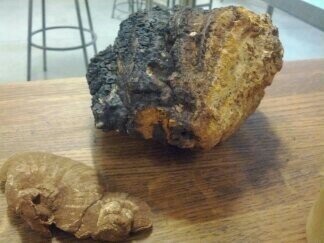 It looks like a charred chunk of wood, and feels a bit spongy or cork-like underneath. It grows high up on an injured birch tree, so the next time you’re out in the woods for a stroll, keep an eye out for this natural wonder, as its medicinal properties are supposed to be truly amazing. Shiitake, on the other hand, are grown by inserting plugs into a hardwood log, and left out where they can be watered on a regular basis. In addition to being a regular vendor at the EBW farmers’ market every Saturday morning, which is supplied by his farm just north of the city, Bruno also organizes workshops specifically on cultivating shiitake. His website is chock full of other interesting tidbits as well for those who are agriculturally inclined. Ah, I do remember one factoid now from the presentation, and that is that only about 150 varieties of mushrooms out of around 14000 species are actually poisonous, which is really not that much; however, Bruno did caution that if you do decide to go foraging for mushrooms, and he hopes that you do, be careful to bring at least two different books with you, preferably local to the region, to help you be certain the kind you find is indeed edible. 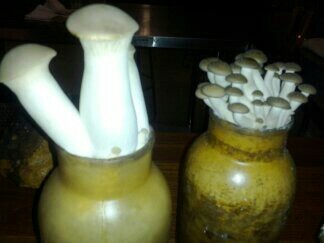 And try not to trample any smurfs while you’re at it, as they can be tricky to spot hanging out under their toadstools. I’m pretty sure they were there first… but maybe that’s the mushrooms talking. This entry was posted in Educational, Food and Drink and tagged April, Drink, Evergreen Brick Works, Food, Fun Guy Farms, mushroom madness, Mycosource Inc., workshop. Bookmark the permalink.